This book restores water, both fresh and salt, to its central position in human endeavour, ecology and environment. Water access and the environmental and social problems of development are major issues of concern in this century. Drawing on water's many formations in debating human relationship with a major source of life and a major factor in contemporary politics, this book covers oceans and rivers to lagoons, billabongs and estuaries in Asia, Oceania and the West Pacific. In an interdisciplinary and cross-disciplinary analysis of the water problem, the contributors address the physical descriptors of water and water flow, and they interrogate the politicised administrations of water in closely corresponding regions. 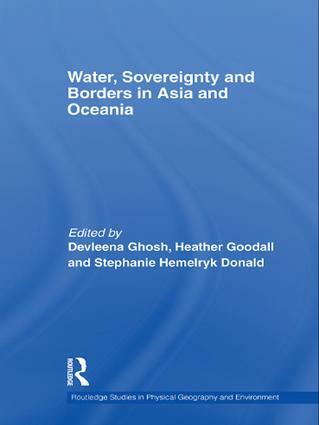 Water, Sovereignty and Borders in Asia and Oceania identifies new discursive possibilities for thinking about water in theory and in practice. It presents those discourses that seem most useful in addressing the multiple crises the region is facing and thus should be of interest to scholars of Asian Studies, Geography, Environmental and Cultural Studies.